On Saturday, November 19th from 10 am to 4 pm you can help Sleeping Children Around the World and experience the magic of the sixth annual Christmas Bazaar and Open House at Hitherfield School. Tables will be set up for over 40 vendors in the gym as well as the Atrium; lunches will be available in two of the classrooms adjacent to the Atrium. This year we are pleased to invite Indigo Books to our bazaar providing book talks, face painting, and so much more to visitors in attendance! 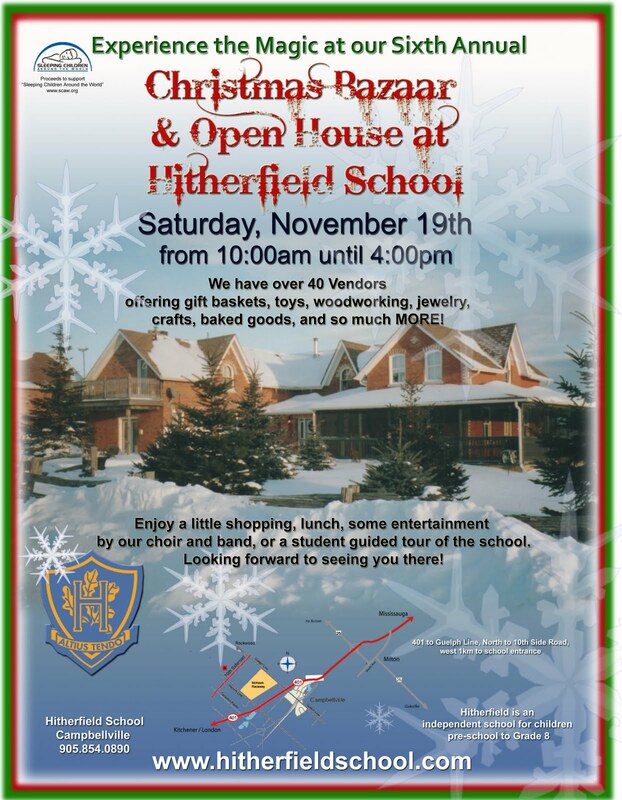 There will be exciting raffles for the children, a 50/50 draw, and “theme” basket raffles for adults. Some of our students will perform their Holiday repertoire on the stage. A bake sale will add the real “sweetness” to the event! Mark the date! All proceeds to support Sleeping Children Around the World. In the past 6 years we have raised close to $20,000 for this very worthwhile and 100% Charity! Submitted by Doug MacDougald, September 20, 2011. 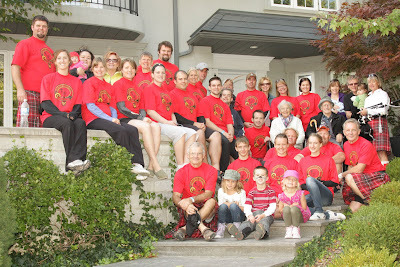 The MacDougald family, for now its twelfth year, had a team in the Stratford Dragonboat Festival and this year raised money for Sleeping Children Around the World. The bedkits will be distributed in Bangladesh where Doug MacDougald will be returning as a travelling volunteer. The four generations of the extended MacDougald Family, led by Walter and Marian MacDougald, are longtime Sleeping Children supporters. The Clan’s ancient motto is “Victory or Death” and, considering the alternative, we are very happy we won the D-flight championship race! Click photo to see it at a larger size. Ronald Reeleder is collecting jerseys to bring to Peru with him for his latest climb up Machu Picchu. He has already conquered Mount Kilimanjaro and the Everest Base Camp. 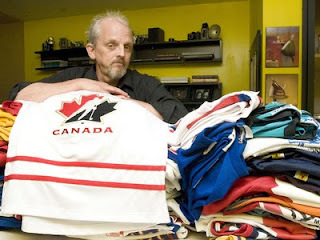 He leaves the sports jerseys with the folks in the countries he visits. Ron Reeleder, 50, takes his charity crusades to great heights. In the past two years, he’s climbed Mount Kilimanjaro and Mount Everest in the name of Multiple Sclerosis research. Next on his list is a trek to Peru to conquer Machu Picchu on Oct. 10. Through a company called Original Trails, the MS Society organizes the trips and three years ago, Reeleder became a contributor. Each climb costs about $2,500 out of his pocket. Over the past two years he’s raised $30,000 for MS. He also started Hockey Jersey’s for Charity, completed the bicycle Ride To Conquer Cancer, and donates proceeds from his photography business to MS. Eventually, Reeleder says, money from the sale of individual photo prints will go to his pet causes. To earn his daily bread, he works as a pastry chef. What is the significance of the hockey jerseys? The hockey jerseys started last year when I went to Everest. I took a few just to give to our porters and stuff. They loved them and somehow they knew what hockey was. So I was sitting there thinking, ‘Well, I should do this every year.’ I came up with Hockey Jersey’s for Charity and I’ve had jerseys sent to me from Boston, Chicago, Vancouver … so far I have over 100 jerseys. I give them to whoever needs them. Next year, I am going to contact as many hockey leagues as I can (for donations). Do you think it’s difficult to get attention for your causes? Yes, because people are inundated with charities. It’s on the TV, it’s all over Facebook, it’s all over the internet — people are asking for this and that and they are knocking on your door. So it is difficult and you have to do something unique and I think the climbs are a good way. Why do so many things for so many different charities? I took my first vacation when I was 45, never been anywhere outside of North America and I was sitting in the Bahamas at a friend’s wedding. I promised myself then, whatever I do, I was going to make my life worthwhile and help others. Sitting in the Bahamas at my age, being able to do that, I thought I had so much that I need to give back. It’s funny because in this country, financially, I’m considered a poor person, when you visit another country like that, they think you have everything and you are rich. We have so much more than everybody else, we don’t realize it. What are your future plans with regard to charities? I want to put out a book, it’s going to be a different approach, I haven’t seen it yet. But I have this red chair that I shoot people in and they donate to any charity they want in the world. They are going to write in (the book) why they’ve picked this certain charity. So the people that are in the book are writing the book. And what mountain would you be climbing next year? Next year will be something totally different … maybe in Southeast Asia ... because I’ve done MS for three years, I am going to pick a different charity. The charity I’m helping next year is called Sleeping Children Around the World. They take bed kits to third world countries — bed kits, mosquito nets, pyjamas. Some of these kids don’t have any of that.